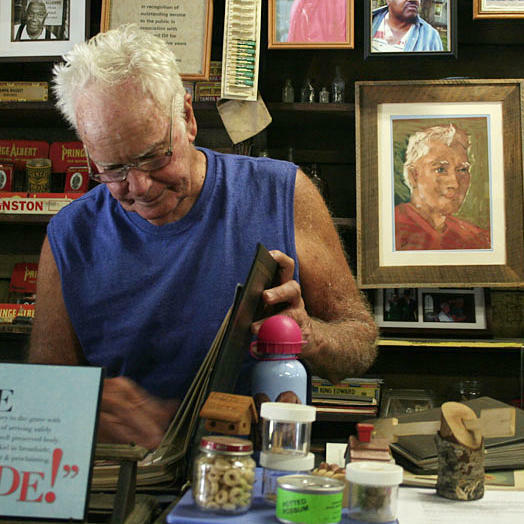 Freddie Wood stands at the counter of the Wood & Swink general store in Evinston, Fla. The Wood & Swink general store sits near the crossroads of two county roads. Wilma Sue Wood, who was Evinston's postmaster for 32 years, says the town's 150 or so residents visit to hear news: "Who's had a baby; who's died." 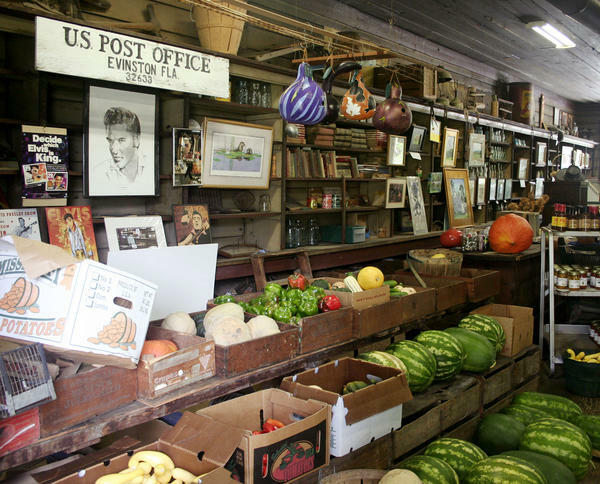 The store also sells produce from the Woods' farm. Evinston's post office is on a U.S. Postal Service list of rural facilities facing cuts in their operating hours. "The post office and the store, I just love it," Wood says. He spends most of his afternoons sitting in a rocking chair in the middle of the store. 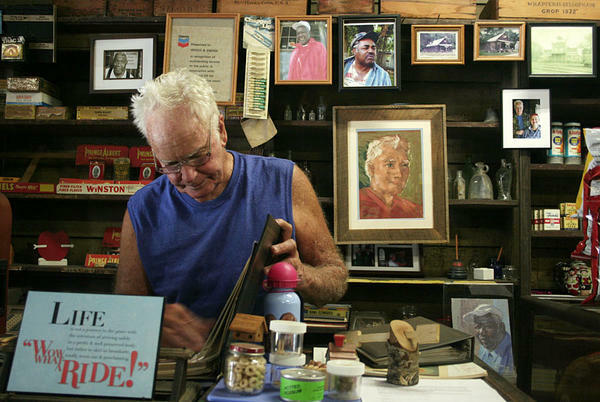 Freddie Wood stands at the counter of the Wood & Swink general store in Evinston, Fla. The store, founded in the late 1800s, houses the oldest post office in Florida. Freddie Wood and Wilma Sue Wood, the former postmaster in Evinston, Fla. Wilma Sue says people visit the post office to learn "who's had a baby; who's died." This month, the U.S. Postal Service begins cutting back hours and services at rural post offices across the country. 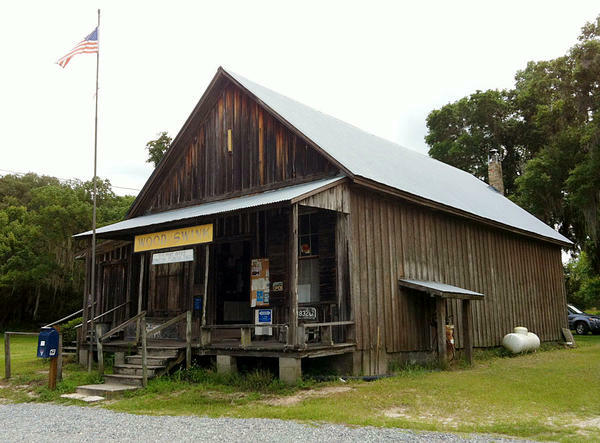 One store facing changes sits inside the Wood & Swink general store in the northern Florida town of Evinston. The store has been in Freddie Wood's family for more than 100 years. In that time, it's gone through only small changes. Wood, a farmer by trade, is married to the town's former postmaster, Wilma Sue Wood. And it's at the store and post office that he holds court. He and his wife recently visited StoryCorps to discuss the coming changes in their community. Wilma Sue was Evinston's postmaster for 32 years. She took the job over from Freddie's father — who had followed in his own father's footsteps. "I've been the grandson of the postmaster, the nephew of the postmaster, the son of the postmaster, and the husband of the postmaster," says Freddie, 75. "How many people are in the town here ... what would you say, Sue?" "I would think there's 150 people in the town," says Wilma Sue, 67. "They go to the post office to visit and find out the news: who's had a baby, who's died." "I have to go every day — love to see people, talk to them and answer questions," Freddie says. "Little feuds here and arguments — you get to hear both sides and you try to stay in the middle. I have to do stuff like that a lot." "And my cousin calls me the Squire of Evinston," he says. On most days, Freddie farms in the morning then heads over to the store in the afternoon. He sells his produce at the store. "We've had a lot of interesting people that come in," Wilma Sue says. "One of the characters, his name was Johnson," Freddie says. "And he would come to the store especially when he got drunk. Once he walked from his house with nothing on but his long-handle underwear. "His wife was a very educated and prissy lady, and they had a cow, and once she came by leading the cow," Freddie recalls. "He says, 'Boys, there's a million-dollar woman leading a 10-cent cow.'" "I said, 'It's a turkey call. Works every time.' "
The Evinston post office was originally slated to be closed when the USPS announced cuts in 2011. But in May, the postal service revised its plan — instead of closing, some post offices are being consolidated; others will have their hours shortened. "The post office and the store, I just love it," Freddie says. "It's almost like a member of the family," Wilma Sue says. "You have to treat it with respect and take care of it. And I think that's what's kept it going all these years." "We get people coming in there, and I don't care whether they're from Montana, Maine or wherever. They say, 'This is just like the little post office in the little town where I grew up,'" Freddie says. "They say, 'That's gone now, but don't let nothing happen to this. Let it be like it is.' "
"And I'd like to keep it like it is forever, if we could," he says. 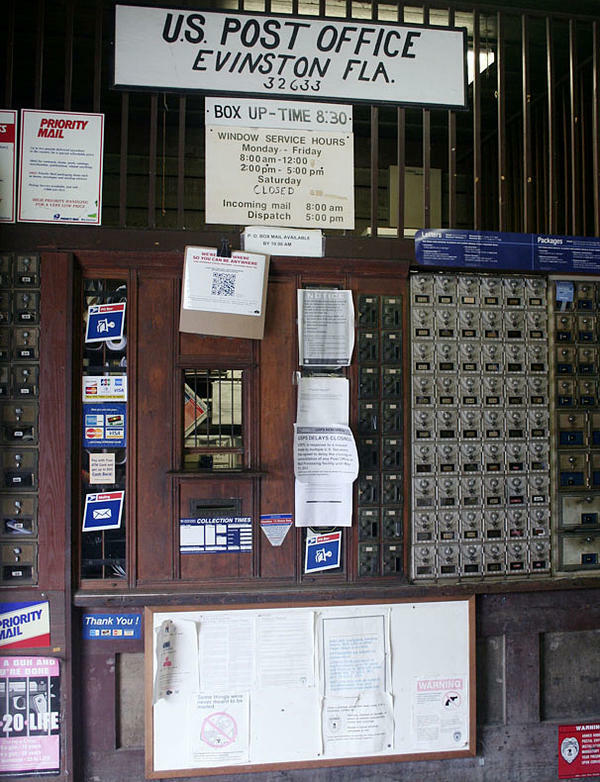 An effort is under way to preserve the Wood & Swink store and its post office. The store is now run by Wilma Sue and Freddie's son. Audio produced for Morning Edition by Michael Garofalo. Special thanks to Jeff Klinkenberg. On this Friday morning, it's time for StoryCorps. The Postal Service is planning to cut back hours and reduce services and thousands of mostly rural Post Offices across the country. 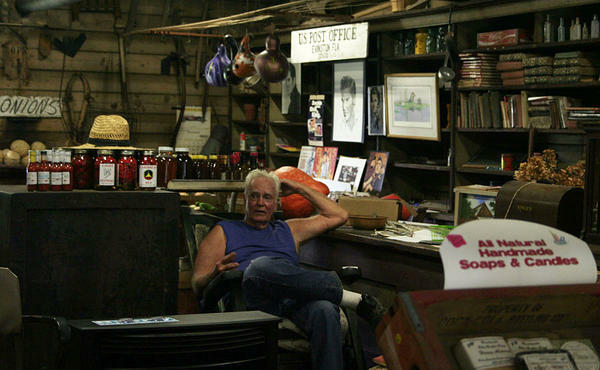 One of them sits inside the Wood & Swink General Store in the north Florida town of Evinston. It's been in Freddie Wood's family for over a hundred years and has barely changed in that time. Each afternoon you'll find Freddie, who was a farmer by trade, holding court there. 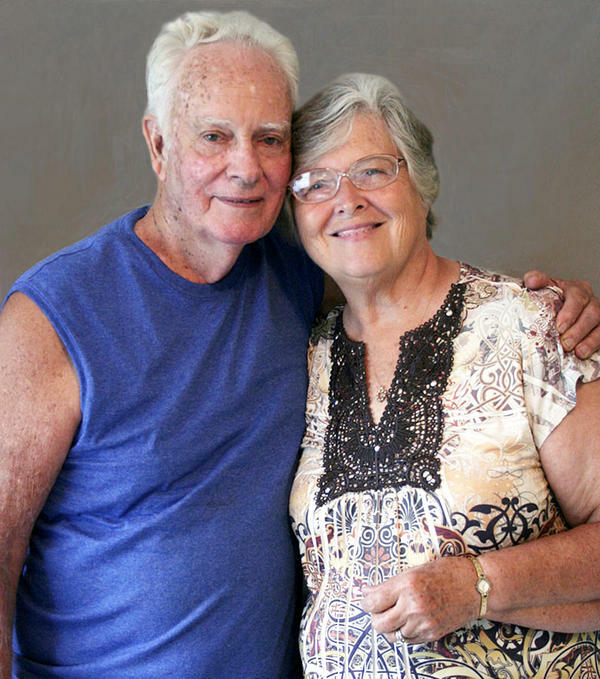 At StoryCorps he spoke with his wife and the town's former postmaster, Wilma Sue. FREDDIE WOOD: My full name is Frederick Wood, Jr., better known around town as Freddie. I have been the grandson of the Postmaster, the nephew of the Postmaster, the son of the Postmaster, and the husband of the Postmaster. How many people are in the town here, what would you say, Sue? WILMA SUE WOOD: I would think there's 150 people in the town. They go to the post office to visit and find out the news, who's had a baby, who's died. WOOD: I have to go every day, love to see people, talk to them and answer questions. Little feuds here and arguments, you get to hear both sides and you try to stay in the middle. I have to do stuff like that a lot. And my cousin calls me the Squire of Evinston. WOOD: We've had a lot of interesting people that come in. WOOD: One of the characters, his name was Johnson, and he would come to the store especially when he got drunk. Once he walked from his house with nothing on but his long-handle underwear. And his wife was a very educated and prissy lady, and they had a cow, and once she came by leading the cow. He says, boys, there's a million-dollar woman leading a 10-cent cow. WOOD: Another time, two couples came in from New York. One of the guys was very rude. And we had some turkey calls, sitting there on the counter. Well I picked one up and gave it a squawk, and he came running over and he says, what is that? I said, it's a turkey call. Works every time. WOOD: The Post Office and the store, I just love it. WOOD: It's almost like a member of the family. You have to treat it with respect and take care of it. And I think that's what's kept it going all these years. WOOD: We get people coming in there, and I don't care whether they're from Montana, Maine or wherever. They say, this is just like the little post office in the little town where I grew up. They say, that's gone now, but they say, but don't let nothing happen to this. Let it be like it is. And I'd like to keep it like it is forever, if we could. MONTAGNE: That's Freddie and Wilma Sue Wood, talking about the Wood & Swink General Store and Post Office in Evinston, Florida. This interview will be archived with all StoryCorps interviews at the Library of Congress. The Podcast is at npr.org. Transcript provided by NPR, Copyright NPR.